If you’re like me, you have a Google Plus account that you seldom check. I think that the only time I ever even think about it is when I get a notification that someone has added me to a circle. I’m pretty dependent to some of Google’s products: search, Gmail, Google Maps, Google Reader, Google Docs. And while I like Google Plus and think it’s great that there’s an alternative to Facebook, I haven’t yet found a really good reason to use it much. Hey Mileage Maniacs! We’re excited to join the Google Plus community! We’re evaluating how to best interact with this community and would appreciate your ideas and feedback. Besides updates on all the great ways to earn and redeem AAdvantage miles, what would you like to see us discuss here? For now both the AAdvantage and the American Airlines pages point to Facebook: AAdvantage points to the oneworld MegaDo contest page and American points to their Travel Tips section on Facebook. So, much like Google Plus, it’s appears to be the early stage of a work in progress. 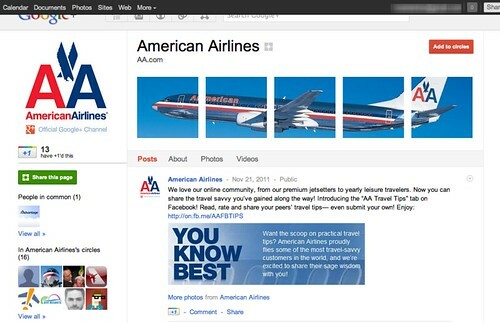 Go here to check on the AAdvantage Google Plus page and here to see the American Airlines Google Plus page. Whether you’re out shopping, planted in front of a television, or finishing pie and working your way through leftovers, I hope that you’re enjoying the holiday.